ESTE SERVIDOR NO TRABAJA PARA HACERSE MILLONARIO, ME GUSTA QUE MIS CLIENTES QUE SON BASTANTES GANEN Y CONSIGAN ES NUESTRA MAYOR PRIORIDAD..
1) 1 BALL TRUCK: CARRERA RELLENA DESDE LAS INCRIPCIONES SALDRA A BUSCAR LA PUNTA PARA UNIR SALIDA CON LLEGADA NO HAY MUCHO Q DECIR DE ESTE EJEMPLAR EN ESTA DISTANCIA SE SALE DE LA GACETA SUPER FIJO ABRIENDO 1000 EN 67,3 CON 12,3 DE REMATE UNA CALISTENIA DE CALENTAMIENTO. 3) 6 SHYSSELKARINA AUNQUE ESTRENA CUADRA Y ANDA BIEN A SU ENTRENADOR SE LE OCURRIO QUITARLE LA GRINGOLA ESTA SE HABRE CON TODA SEGURIDA..
BUENO DESDE YA ACTIVADA TODA MI INFORMACION PARA LAS JORNASDAS HIPICAS EN LOS DIFERENTES HIPODROMOS YA SEA SANTA RITA, VALENCIA O LA RINCONADA. 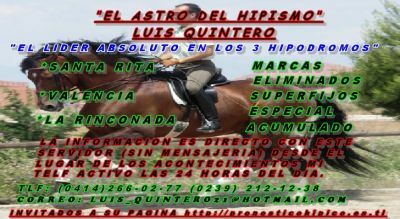 MI INFORMACION LA PUEDEN OBTENER DISCANDO EL (0414) 112 60 21 LUIS QUINTERO “EL ASTRO DEL HIPISMO"
1) LA INFORMACION COMPLETA DESDE LA 1RA HASTA LA ULTIMA, CON SU RESPECTIVO COMENTARIO Y EL POR QUE LO ESTAMOS JUGANDO, LOS ELIMINADOS POR CARRERA, LOS CAMBIOS A ULTIMA HORA Y LAS MARCAS DE OFICINAS COMPLETAS (LA SEMANA COMPLETA 400BF Y SI DESEA RECIBIRLA POR UN SOLO DIA DE CARRERA COSTO 200BF) NO DES VENTAJA Y LLEVATE LA MEJOR INFORMACION DEL MERCADO CON LOS PROFESIONALES DEL MEDIO HIPICO..
2) LA JUGADA VIP JUGADORES FUERTES QUE SOLO BUSCAN 3 EJEMPLARES POR CARRERA Y DEJAN AL BANQUERO LIMPIECITO(LA SEMANA COMPLETA 300BF Y PARA UN SOLO DIA DE CARRERA200BF) NO SIGAS CAYENDO EN AQUELLOS QUE CREEN SER PRONOSTICADORES Y LO QUE HACEN ES ESTAFAR MOSCA QUE HAY MUCHOS POR ESTE MEDIO DESDE YA LA INFORMACION ACTIVADA..
“LOS PLANES ESTAN ACTIVADOS PARA LOS SUSCRITORES QUE SIGUEN RESPONDIENDOLES A ESTE SERVIDOR"